COMMENT: There are increasing numbers of calves being reared on Irish dairy farms in response to the removal of milk quota restrictions next year. In some cases, calf-rearing facilities and systems that have worked heretofore may now be under excessive pressure. Increasing numbers must not increase mortality or reduce calf performance. Heifer calves are the foundation stones of a dairy business. However, far too many farms struggle with unacceptable calf mortality and/or poor heifer rearing performance. Consideration must be given to correcting this without delay or contracting the job out to a skilled calf or heifer rearer. Regardless of numbers, the basics of calf-rearing never change – colostrum, hygiene and regular observation. Where large numbers of calves are arriving together in a compact calving system, increasing numbers of farmers are now routinely drenching each calf with colostrum. On our farm we do this twice in the first six hours via stomach tube, ensuring that each calf receives 10 per cent of their bodyweight in colostrum in this critical period. We have learnt that while this increases the workload around calving time, it is a far better use of our time than treating sick calves at a later date. We are happy to report that since adopting this strategy, calf illness and mortality from infectious diseases has all but disappeared. Each tubing of colostrum is carefully recorded so as to avoid confusion or one calf getting too much and the next calf little or none. Anyone with experience of small children is very conscious of good hygiene regarding hands, feeding equipment, bedding material etc. A similar strict approach in the calf shed delivers rich dividends. In the first four weeks of life, all feeding equipment should be thoroughly rinsed twice daily. In our case, we also do a weekly hot detergent wash of all calf feeding equipment. If different ages of calves are sharing equipment, feed the younger ones first, rinse equipment, and then feed the older batches. Ensure hands are clean when feeding calves. Wearing a fresh, clean pair of nitrile gloves is good practice and not expensive. After four weeks we are more relaxed around washing feeding equipment as the calves have now begun to develop their own active immunity. At all times, liberal use of straw or preferred bedding material is recommended. Thankfully the frustrating practice of training calves to stick their head into a bucket and drink appear to be gone. Training calves to adapt to sucking from a teated bucket in small groups of four and six is now the norm. Once trained calves can then be batched up into groups of 10 and 12. Regroup lighter ones to a more appropriate group if they are struggling to compete for milk intake with their peers. 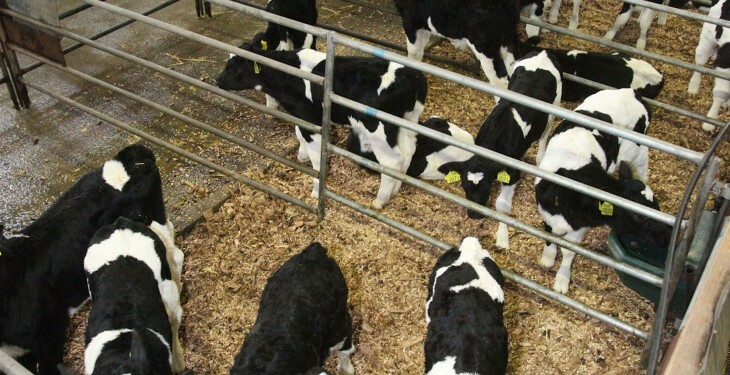 However, regrouping calves should be kept to a minimum in case any disease threat exists. On our farm we continue to feed a total of 10 per cent of their bodyweight in milk or milk replacer in two feeds. Calf crunch & hay are introduced at a week old. Having done the colostrum and hygiene bit, we find that feeding twice per day is a huge aid to calf observation. 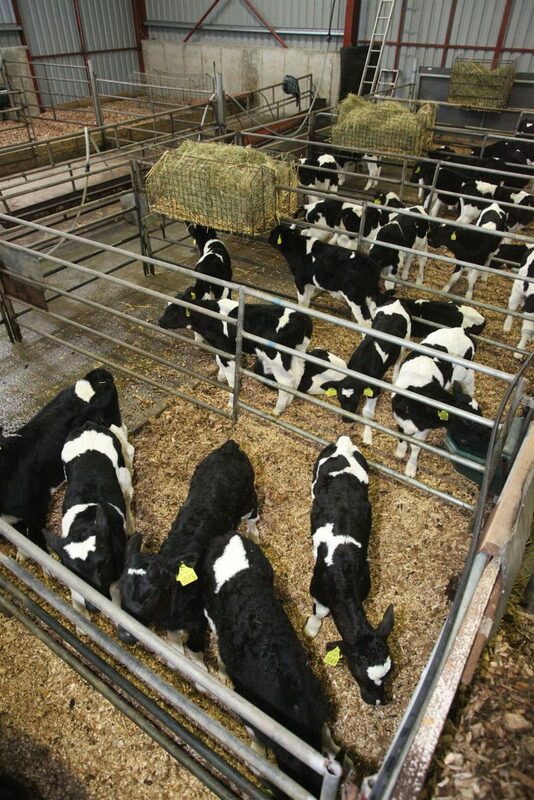 Observe calves carefully at each feed. Do they rise and approach the feeder enthusiastically at feeding time? Do they finish feeding early and lie down? Are they frisky – running about when fresh bedding is introduced? Any coughing? Any scour visible in the calf pens? Any calves with dirty tails? A skilled calf rearer will spot any problems very early. If infectious, these can be confirmed via a simple calf thermometer. Early corrective action can then be taken.